This is where all of the latest events, contests and updates will be posted by staff for everyone to read and comment on. You should read over everything found within this forum if you'd like to familiarize yourself with the rules and systems that you must follow. Here you'll find information on the world of Sosaria, past events and the general background of the world and everything else you need to know. Even if you're not new to role-playing, there are plenty of guides herein with useful information for anyone and everyone. This is where you may either introduce yourself to the rest of the community, or where you may bid your temporary or final farewells. This is where you may post about various subjects that may or may not have anything to do with the board itself. In this forum, members may post topics to give their feedback on anything regarding the site, or to contribute your own ideas. This is where linkbacks and affiliations between sites may be posted. This is also where the official advertisement for our site may be found. The Serenian Kingdom, or Serenum, is a vast and glorious kingdom founded by Primians in the earliest days of the Dark Ages. 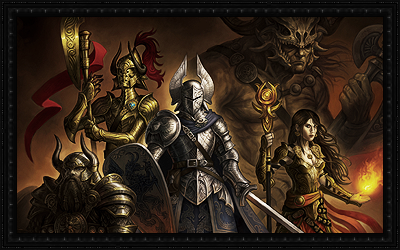 Founded in honor of Lux, the Sun God, the people of Serenum typically worship him with great fervency. In fact, it is said the ruler of Serenum is decided and guided by Lux himself, although whether or not this is true is a matter of debate. Despite this, Serenum has a rich and vibrant culture. The Republic of Yew, founded by Valens and Holzelves, is both a city, as well as an independent Republic. Few cities in the world are nearly as fortified. Yew, named after the Grand Yew Tree around which the Republic was established, is intertwined with nature, with a large amount of their infrastructure being built along trees. The only entrance is through the Yew River, but those who guard the gates are discerning of who they allow entrance. Winter's Keep is a castle in the midst of the arctic tundra just southwest of the Lunari Kingdom. The keep was established over a century ago by the greatest mages from all of the Elven races. To this day, it stands as a beacon for the greatest magical minds throughout the globe. Although the entrance exam is excruciatingly strict, anyone is welcome to audition. Far north of the Serenian Kingdom is the Lunarian Kingdom, or Lunari, situated deep within the icy tundras that may be found there. It was founded by, and is largely comprised of, dark elves and dwarves. Lunari has a history of isolationism and self-interest, only engaging with other kingdoms when it greatly benefits them. Although they've been mostly peaceful for a decade, they can be aggressive towards outsiders. The Dentronian Kingdom, or Dentron, is a series of massive underground hubs interconnected by tunnels. Although the majority reside beneath the surface of the ground, the only means of entrance from this level is along a wide bridge entrance leading into a gigantic tree. This tree acts as the primary guard post and a filtration system for immigrants or visitors alike. The Pluvian Kingdom, or Pluvia, is comprised of many series of structures built along the insides of many valleys centuries ago. Although initially founded by high elves, they've begun allowing immigration of other races into their kingdom in recent years due to a desire for a higher, more diversified population. Even yet, it remains nearly homogeneous. The Sosarian Sea consists of the entire ocean surrounding the continents of Sosaria. It's depths are immeasurable and filled with all varieties of creatures that can't be found on land. Between sea monsters and unpredictable storms capable of devastating entire fleets, any voyage through these waters will be riddled with both danger and adventure for those brave enough to take the risk. The dark and dreary entrance to the Underworld may be found on a small island just west of Serenum. Although the damned spirits found herein may never leave, it's said that one can communicate with those who have passed on, should they prove capable of surviving the demonic entities and other malicious spirits that inhabit the realm and successfully enter the Underworld at the end. This is where you'll initially create your character, including all of the little details about them. This is required before you're allowed to RP. This is where you may fill out the template to create custom martial arts moves, which are moves that utilize stamina in order to use. This is where you may fill out the template in order to create a custom spell, which is a move that makes use of mana in any capacity. 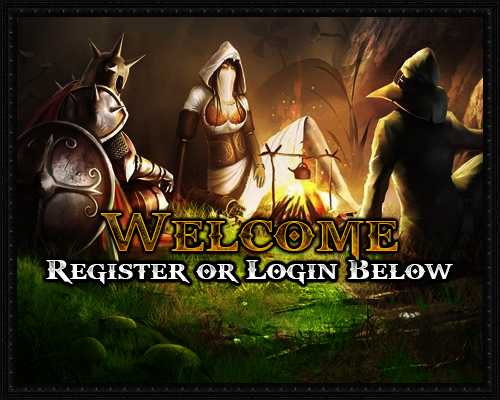 This is where you may fill out the template to create custom equipment and items, such as armor, weapons, potions or anything else. Here is where tamers, and evocation mages, may apply for new creatures to be introduced to the world for taming or summoning. Here is where anyone may apply for a building which may either be purchased or built after approval. 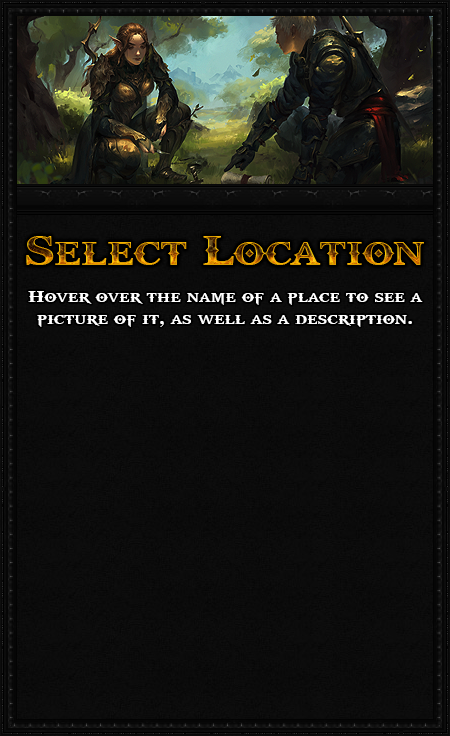 Here is where you may fill out the template to create new quests for yourself, and other adventurers, to take on once approved by a loremaster. Have an idea for a major event or additional part of our lore? Anything from a new race, to a new place or even a major event may be suggested. You may provide as many, or as few, details as you wish, since it may be subject to revision. Once your character's been approved, you should copy the template found in this topic and paste it into a new topic to be filled out with their information. Although it isn't required to RP, you may only RP in PVP Protected areas. Once you have tamed an animal, you must copy the template found here and paste it into a new topic before filling out. Once you've done so, and it's been approved by a member of staff, they'll officially become your pet. Should you decide to establish a guild, this is where you may fill out the template to have your guild officiated, as well as keep track of your guild's information and the members that comprise it. If you're the leader of a city, you may fill out the template found in this forum to keep track of your city's information. This is also where you'll handle any additions or changes to your city in the future.